WASHINGTON — Days after Rocket Lab launched a payload for one U.S. military agency, the company announced its next mission will place three technology demonstration satellites into orbit for the U.S. Air Force. 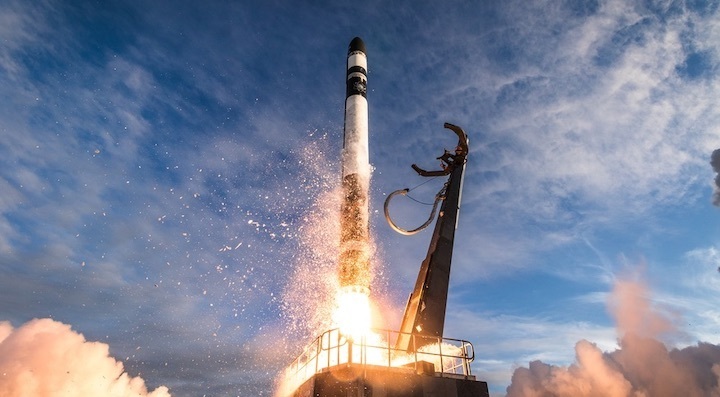 Rocket Lab said April 3 its next Electron mission, scheduled for late April, will be for the Defense Department’s Space Test Program in partnership with the Defense Innovation Unit. The launch will carry three satellites sponsored by the U.S. Air Force and Army to demonstrate advanced satellite technologies. The largest of the three is Harbinger, a smallsat built by York Space Systems for the U.S. Army Space and Missile Systems Defense Command to test the capabilities of the company’s new smallsat platform. Also on the launch is Space Plug and Play Architecture Research CubeSat-1 (SPARC-1), sponsored by the Air Force Research Laboratory in cooperation with the Swedish military to test modular spacecraft avionics. The third satellite is the Air Force Academy’s Falcon Orbital Debris Experiment (Falcon ODE), which will provide calibrated radar and optical targets for ground-based space situational awareness sensors. The combined payload mass for the mission will be more than 180 kilograms, making this the heaviest Electron payload to date. The company had previously advertised a payload capacity of 150 kilograms to sun-synchronous orbit for the rocket. Peter Beck, chief executive of Rocket Lab, said in an interview that conservative margins for those earlier missions, as well as a lower orbital inclination planned for this mission, enabled the heavier payload. The launch is part of the Air Force’s Rapid Agile Launch Initiative (RALI), a congressionally mandated program to support procurement of small launch vehicles in a more commercial manner. According to Air Force budget documents, Congress allocated $14.5 million to the program in fiscal year 2017, of which $5.7 million went to Rocket Lab for a dedicated launch mission. “RALI demonstrates rapid procurement and the responsiveness of commercial launch, dedicated launch for small payloads to militarily-relevant orbits, on-demand responsiveness, and increased operational tempo over legacy national launch architecture,” Lt. Gen. David D. Thompson, vice commander of Air Force Space Command, stated in prepared testimony before the Senate Armed Services Committee’s strategic forces subcommittee March 27. The upcoming launch comes after Rocket Lab successfully launched the Radio Frequency Risk Reduction Deployment Demonstration, or R3D2, satellite for DARPA March 28. The launch was the first Electron mission of 2019, delayed by about a month because of payload readiness. Beck said that the company expects to perform future launches on a monthly basis. “We have a whole raft of spacecraft that are on the books for this year, so we’re moving straight into monthly cadence,” he said. That includes demonstrating the ability to perform launches two weeks apart before the end of the year. The upcoming launch, like all previous Electron missions, will take place from Rocket Lab’s launch site in New Zealand. Beck said that development of a second launch pad at Virginia’s Mid-Atlantic Regional Spaceport is going “really well” and should be ready to host its first launch before the end of this year. The upcoming launch will be the sixth for the Electron and the fourth since Rocket Lab declared the vehicle operational. Beck said he’s seeing growing demand for the vehicle, with the company’s 2019 manifest now full and its 2020 manifest also filling up even with a higher cadence of launches planned for next year. That interest comes despite the growing number of other small launch vehicles entering the market — or perhaps because of it, given the delays other vehicles in development have suffered, Beck suggested. “I think we’re in a very unique position because we are actually delivering stuff to orbit,” he said.